The Rancho del Paso horse boarding stables and equestrian facilities have been built to U.S. standards--generous size, quality materials, safe and secure, and easy to use...in addition to being beautiful and luxurious. 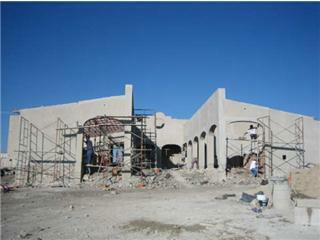 Over three-quarters of a million dollars has been invested to date in constructing these facilities for 10 lucky horses and their riders. Ten 12' x 12' stalls, open, airy, well-lit, well-drained, thick bedding, feed and hay container off the ground, 2 water buckets. Half of these stalls are dedicated to the owners' horses, and half are available for boarders. Three grassy turnout areas with safe metal fencing, water troughs (cleaned weekly) with automated water dispensers, sun shelters with salt blocks. Turnouts are watered all winter long to keep the grass green for good forage. The horses' turnout time is scheduled and rotated to keep the pastures green and healthy. Boarders' lounge has a guest bath, sink for cleaning tack, and a fridge and microwave. 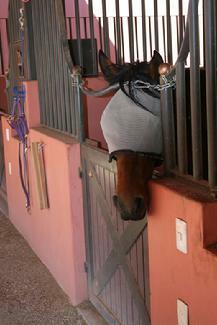 The 15' x 20' tack room has individual storage for each stall, well lit and well ventilated. 6 car parking area inside the secured, and automated entry gate. 90' x 125' walled riding arena has a gravel base for drainage topped with a 10" layer of soil and sand, regularly-mowed grass on top of that to limit dust and puddles. Round pen with sprinklers to cut the dust, dedicated horse wash area, and vet stocks. Regularly scheduled worming (with worming paste imported from the U.S.) is included in the horse's board. On site trainer available for training or working your horse (for a fee). Every pasture has shade and water - and a view of the lake! 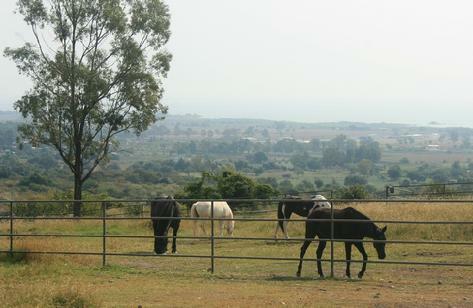 Horses grazing in RDP pastures (Hacienda Alta 1 in the background). 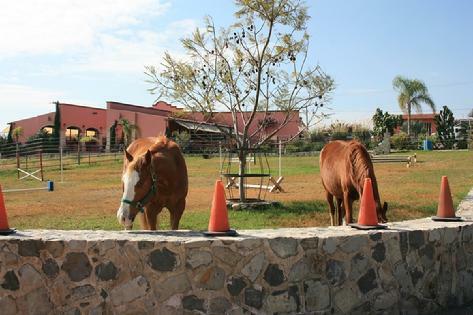 Rancho del Paso is named after the owners' Peruvian Paso horses. Peruvians are known for their incredibly "Paso Llano" smooth ride, coupled with the flashy movements of their front legs ("termino"). Here is a video to demonstrate that gait to you. This is our Peruvian stallion Soñador. 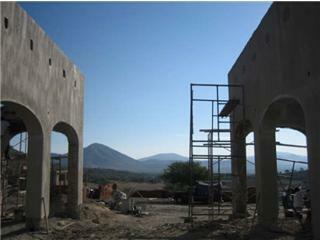 We continue to poke at fixes for the high alkalinity of the water in this part of Mexico. It seems to be an endemic issue in the local water supplies – we’ve tested our well, the SIMAPA water, and a truckload of water brought in from a water supplier in Tlajomulco. They all tested off the top of the charts for pH and alkalinity. Blood tests done on 4 of the horses here all show somewhat low red blood counts, and this may be due to the high alkalinity affecting the bio-availability of iron. In January we added a filter to our well water which cleans out the mud in the water – it’s nice to have clear water in the taps in the house and the barn but it didn’t change the alkalinity. We’ve been adding small amounts of food-quality citric acid to the horses’ water buckets since mid-February, and it doesn’t seem to bother them, they still drink several buckets a day plus whatever they drink in pasture. The citric acid lowers the pH of the water into a neutral range, and citric acid in the diet makes it easier to absorb iron and other minerals. It also has the added benefits of providing anti-oxidants to the horses, and keeping their water fresher. Our first class farrier migrated to the United States, where he can earn MUCH more money. We have a good basic farrier who lives nearby, he charges 300 pesos to trim and shoe a horse. Javier and his helper have been re-painting the metal in the stalls – when they get to the swing-open manger, they have to take it off its hinges, steel brush and sand the rust off it, prime it, paint it and then let it dry. That takes a whole day, so we’ll be shifting horses around the stalls while we’re doing this. Soñador, our palomino Peruvian stallion, has been gelded; he will be much easier to ride now. We have a foal by him out of Gracie's daughter, RDPc Niña Chocolatina. Soñador's foal is a chestnut filly who is the spitting image of her dam Niña; we've named this filly RDPc Coba de Chapala. The other day I made a comment about our horses enjoying chowing down on green grass every day, and someone challenged me “We’re in the middle of the dry season! How could you possibly have any green grass?” That made me realize how absolutely fanatical (heck, beyond crazy) we are about maintaining green grass year ‘round for the horses. We feel there are incredible psychological benefits from horses being able to move around freely, in the company of other horses. But there are also nutritional benefits from fresh green forage, in particular the vitamins which are lost when grass is dried into hay. Yes, there can be danger in green grass for insulin resistant horses, overweight horses, and horses that do not get enough exercise. We’ve planted a forage grass, Estrella Africanus, which is not high in sugar; and we keep our horses on a low starch, high fiber diet. Nonetheless, there are a couple of horses in our barn who wear grazing muzzles for the initial months of the rainy season, when the grass is growing so green and sweet. 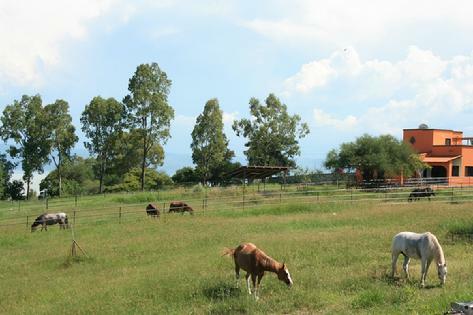 Water – We have our own deep well (185 meters deep), and we water the pastures 5 days a week during dry season. We have an extensive network of underground piping which carries water out to some fairly massive sprinklers. This all takes constant maintenance, and a tremendous amount of electricity to pump the water from the well to the sprinklers – we have 18 solar electric panels installed on the barn roof to provide the power needed. pH – Both the soil and the water here are tremendously alkaline here, off the top of the scale. We’ve started spending 2000-3000 pesos a month to augment our water supply with phosphoric acid. This brings the water’s pH down to 7.8 or 7.9, and the pastures and gardens have really perked up. We also spread either ammonium sulfate or powdered sulfur on the pastures several times a year, to ameliorate the soil alkalinity. Fertilizing and Harrowing – Pastures are fertilized and harrowed several times a year. Mowing – Over the full growing season the Estrella Africanus grass grows tall and eventually becomes dry stalks – the horses won’t eat this, so we cut the tall grass down. Weeding – It’s a constant struggle to maintain a pure grass pasture, we hand-weed each pasture several times a year. Limiting grazing time – During dry season, horses are allocated 2 – 3 hours a day of grazing time, in selected small groups. They get more time in pasture during the rainy season but if the pastures are muddy, they don’t go out, as their hooves would quickly destroy the grass roots. Yup, it’s a lot of time, trouble and expense to go to – but it is so worth it, to see the horses happily cavorting or munching in pasture.